Hue Serene Palace can be found down a narrow bumpy street in central Hue. 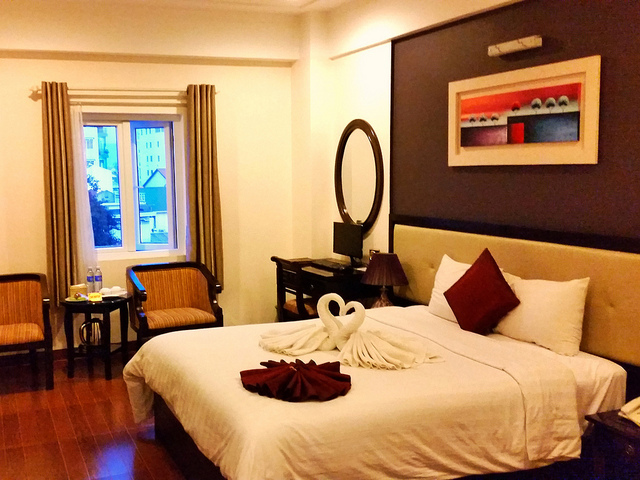 The location is ideal, surrounded by a fair share of decent restaurants and a couple of blocks from the Perfume River (walk or short taxi to the historic capital). Rooms are large, clean and modern. A television and workspace that includes a computer (if you work on vacation like we do) is also included. Bathrooms are spacious and include a either a bathtub or separate shower. A large breakfast is included in the rate. Tip: be sure you book a room with a window and request a higher floor otherwise you'll have a view of the neighboring building. Check out our Hue Blog post.